A static hazard in a logic network is a transient change of an output value which is supposed to remain fixed during the transition between two input states differing in the value of only one variable. When the output is supposed to remain at â€œ0â€, but it is likely to go high (to logic 1) momentarily during the transition of input states, then the hazard is called as a static 0 hazard. A static 0 hazard is shown in Figure below. On the other hand if a momentary â€œ0â€ is likely to occur in the output when it is expected to remain â€œ1â€, then the hazard is called as a static 1 hazard. Figure below shows a combinational circuit with hazards and the relevant waveforms. Initially A = 0 and B = 1. Hence output G1 = 0 and G2 = 1. At t = t1, A changes its state to become 1. So now A = B = 1. The output of gate 1 i.e. G1 becomes high after a time delay equal to the propagation delay of AND gate 1. The output of gate 2 i.e. G2 goes low after a time delay which is equal to the sum of propagation delays of the inverter and the AND gate-2. Hence output Y goes high for a short duration as shown in Fig. 2.12.2(b). This short duration HIGH pulse is unwanted and called as a static 0 hazard. Illustration of Static 1 Hazard : Consider the network of Figure below. Let the input status initially be ABC = 1 1 1. Where as the initial output Y = 1. Now let the input state be changed to ABC = 101 from 111. i.e. the value of only B input is changed. The final output Y is expected to remain 1 even for the changed input state. But practically it does not happen so, if the NOT gate has an appreciable propagation delay. 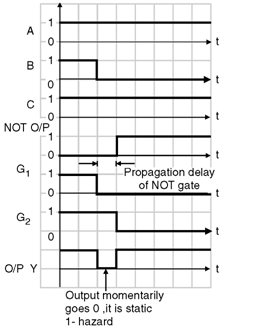 The effect of long propagation delay of the NOT gate is illustrated in Figure. Thus output Y goes to 0 momentarily as shown in Figure below. This is called as static 1 hazard. We have illustrated the static hazards by assuming the propagation delay of a NOT gate to appreciably longer than the other gates. But in practice, each gate will have a finite propagation delay resulting in delays being distributed throughout the network. Depending on the value of delays, momentary output signals can occur. Thus even the two level logic networks can have hazards. The term hazards specifies the unwanted switching transients or false outputs or glitches which appear at the output of a circuit. These transient false outputs are due to finite propagation delay times of the components along different paths within the network. Difference in the propagation delays corresponding to different signal paths result in hazards. A hazard can be defined as the actual or potential malfunction of a logic network during the transition between two input states when a single variable changes. Malfunctioning means any deviation from the intended response. In the combinational circuits, the hazards will result in a false output value. But if such combinational circuits are used as a building block of an asynchronous sequential circuit then it will result in a transition to incorrect stable state.